Categories: Domestic Adoption, Open Adoption, Adoption Fiction, Adoption Memoirs, Adoption Parenting, Agency Essentials, Classic Adoption Books, Domestic Adoption Memoirs, Educating Others, Tapestry Picks, About Adoption, Making the Decision. Prior to 1990, fewer than five percent of domestic infant adoptions were open. In 2012, ninety percent or more of adoption agencies are recommending open adoption. Yet these agencies do not often or adequately prepare either adopting parents or birth parents for the road ahead of them! The adult parties in open adoptions are left floundering. There are many resources on why to do open adoption, but what about how? Open adoption isn’t just something parents do when they exchange photos, send emails, share a visit. It’s a lifestyle that may feel intrusive at times, be difficult or inconvenient at other times. Tensions can arise even in the best of circumstances. But knowing how to handle these situations and how to continue to make arrangements work for the child involved is paramount. This book offers readers the tools and the insight to do just that. It covers common open-adoption situations and how real families have navigated typical issues successfully. Like all useful parenting books, it provides parents with the tools to come to answers on their own, and answers questions that might not yet have come up. 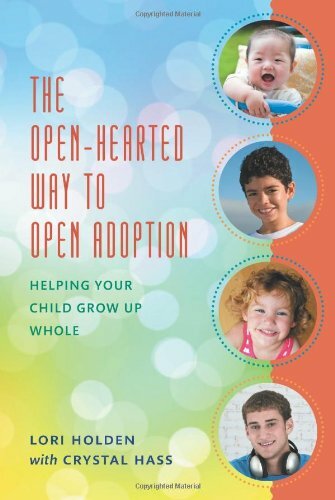 Through their own stories and those of other families of open adoption, Lori and Crystal review the secrets to success, the pitfalls and challenges, the joys and triumphs. By putting the adopted child at the center, families can come to enjoy the benefits of open adoption and mitigate the challenges that may arise.